Running a call center can be a tricky business. Keeping staff motivated and stimulated in call centers is extremely important in order to keep both morale and productivity high. Many service centers have implemented performance plans and incentive systems to help employees stay enthusiastic and focused on their goals. One way to improve performance and keep up customer satisfaction rates is to keep call routing up-to-date. Cut down on the time-wasting experience of having customers talk to representatives who aren’t able to help them or can only redirect them to other call center employees. Enhanced call routing will send customers to a representative who can help them with their query efficiently and effectively. Customers are more easily satisfied and get the added benefit of a more personalized service. As well as call routing, there are other behind-the-scenes technologies that can be useful for improving performance at call centers. Several software companies provide organizational products but a call center will keep track of metrics and performance for you, making the process easy. Monitor customer care analytics to keep track of client retention or new clientele and see where improvements need to be made. A final key in getting employees to work towards a goal while creating a positive atmosphere is to provide incentives. Whether it is the number of upgrades sold, or queries solved or simply answered calls, goals help workers focus. On top of that, rewarding employees with high-performance rates further incentivizes others to work to that standard. In this sense, goal and incentive programs set a benchmark, or standard, of work for the rest of the call center team, resulting in better overall performance. Creating the right atmosphere and energy for a high-performing call center can be difficult. 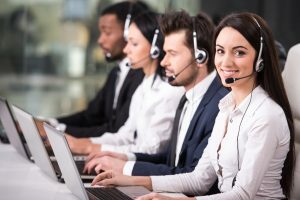 A highly favorable solution in the business world is to turn to a call center service, like Center Communications, as they’ll take care of the entire workforce for you, goal orientation and all.